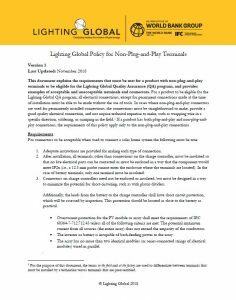 This policy explains the requirements that must be met for a product with non-plug-and-play terminals to be eligible for the Lighting Global Quality Assurance (QA) program, and provides examples of acceptable and unacceptable terminals and connectors. For a product to be eligible for the Lighting Global QA program, all electrical connections, except for permanent connections made at the time of installation must be able to be made without the use of tools. In cases where non-plug-and-play connectors are used for permanently installed connections, the connections must be straightforward to make, provide a good quality electrical connection, and not require technical expertise to make, such as wrapping wire in a specific direction, soldering, or crimping in the field.1 If a product has both plug-and-play and non-plug-and-play connections, the requirements of this policy apply only to the non-plug-and-play connections.